Comfortably and modernly equipped room with an area of 21 m2. It perfectly meets the expectations of individual guests, business and families with children. The decor combines elements of modernity with regional stylization. 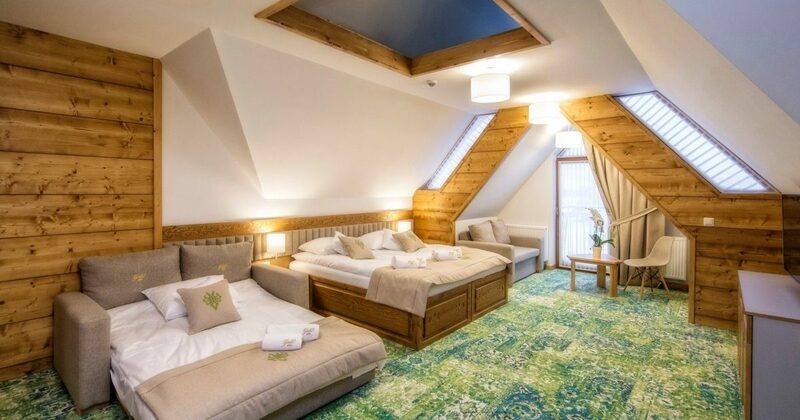 The room has two beds measuring 90x200 cm with the possibility of joining a double bed and a single extra bed in the form of a sofa bed with a dimension of 90x200 cm. The room has a balcony. Available: air-conditioning, LCD TV, telephone, wardrobe, desk, bathroom with shower, cosmetics, bathrobe, slippers, hairdryer, minibar, private safe, kettle (coffee, welcome tea). On request, an iron and ironing board are available.